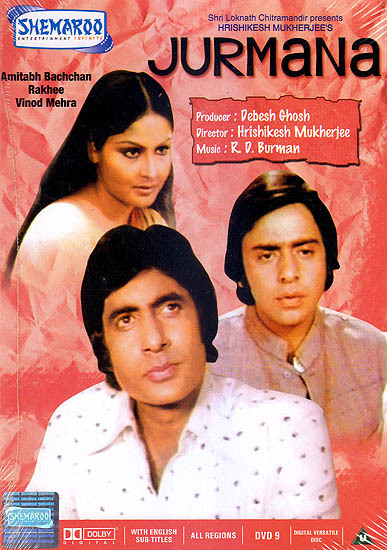 When Inder Saxena (Amitabh Bachchan) a smooth talking lathario who believed that his heart was in his wallet, met Rama Sharma (Rakhee) a poetess in a sleepy little town in U.P things would never be the same. Rama wanted to be wooed and loved like any young woman, not worshipped as she was by the same. Rama wanted to be wooed and loved like any young woman not worshipped as she was by the townspeople for her poems. Soon Rama was won over by Indra’s smooth talk and she was won over heels. There was no place in her heart for the adoration of Prakash (Vinod Mehra) her childhood friend. Rama’s father Prof. Sharma (Shreeram Lagoo) was an old fashioned man. He believed in the sanctity and purity of human relationship. When such diverse and conflicting characters meet emotional, social and ethical conflicts are bound to arise. And in such conflicts somebody and everybody has to pay the price (Jurmana). Memorable Melodies Sawan ke Jhule, an expquisite song by Lata Mageshkar.